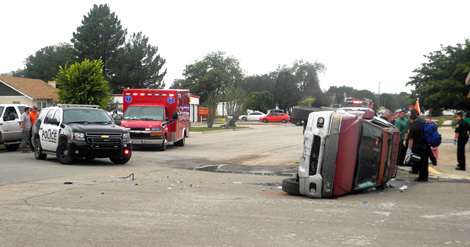 A car accident that occurred this morning near Texas Avenue and Sixth Street resulted in one vehicle rolling and a man being transported to Artesia General Hospital with non-life-threatening facial and head injuries. According to Artesia Police Department Cmdr. Lindell Smith, the driver of the rolled vehicle was travelling north on Sixth and did not stop at the posted stop sign. He was issued a citation for a stop sign violation. The other driver was not injured, and both vehicles were towed from the scene.